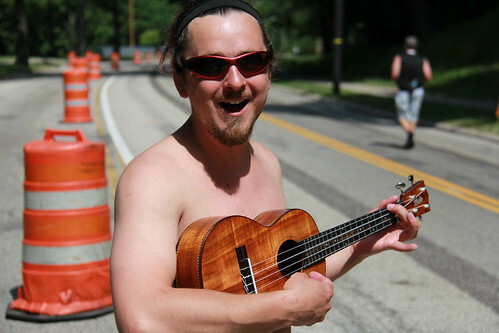 This guy was definitely one of the highlights of our marathon-cheering experience today--he'd been out since 7 AM, strumming his ukulele, and serenading passing runners with tunes like "Surfer Girl" and "The Lion Sleeps Tonight". Yes, he was wearing pants, despite their unfortunate omission from this shot. The other big surprise of the race was this guy, who schooled us all on what true multitasking looks like by juggling while running a freakin' marathon. I mean, jeez, way to make everybody else look bad!